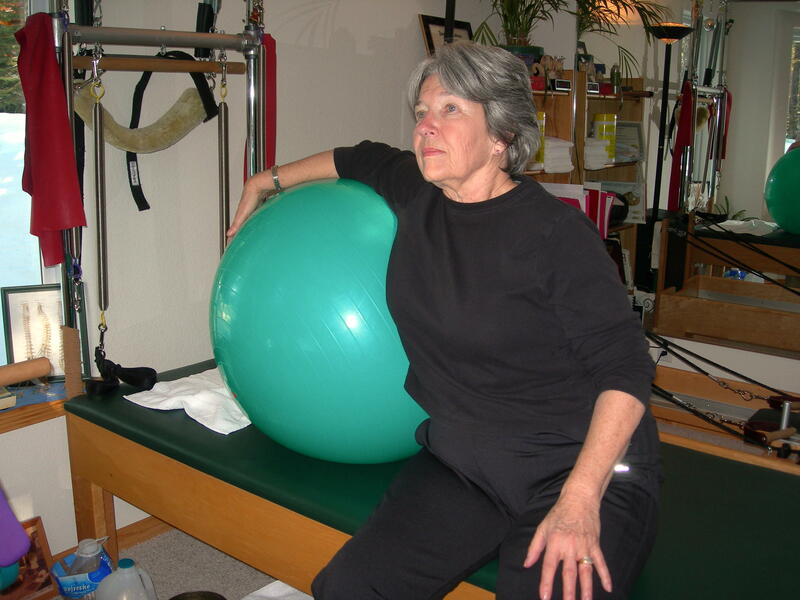 Parkinson’s clients can benefit immensely from the Pilates method’s focus on breath. Breath is a basic characteristic integrated into all of the Pilates equipment and matwork exercises, and provides oxygen to the cells promoting better health. The same dynamic that creates difficulty with repetitive movement in people with Parkinson’s Disease can also negatively affect respiration, causing shortness of breath or dyspnea. Breathing exercises providing proprioceptive feedback can “wake up” the muscles of respiration for a deeper breath, but singing can also be a useful and fun tool to incorporate in a Pilates session. Mayo Clinic Parkinson Specialist J. Eric Ahlskog, Ph.D., M.D. suggests, in The Parkinson’s Disease Treatment Book on page 299, that after other medical conditions are ruled out, Parkinson’s Disease (“PD”) could contribute to dyspnea. Most people are not in touch with their shallow breathing until it is brought to their conscious attention. In Parkinson’s clients, since muscular awareness can be diminished, it is often necessary for the instructor to touch the muscles in the ribcage for the person to feel the area expand and contract or have the individual feel it with his/her own hands during the breath. Since the type and timing of medication will affect muscular coordination, be sure that your client does his/her best to perfect the timing and dosage of medication to be in an optimal physical state for exercise. In the following exercise a Physioball is used as the proprioceptive tool to increase awareness of the chest expansion and contraction. This exercise can “jumpstart” the respiratory muscles and give your client the ability to direct the deeper breath. The expansive breath will facilitate the oxygen exchange when progressing to exercises using the Pilates equipment. Practicing deep belly breaths or diaphragmatic breaths can be useful to start the process, but ultimately the breath needs to derive from the expansion and contraction of the ribcage (without the shoulders rising and lowering), not the belly. Most of the Pilates exercises require costal breathing, since the abdominal muscles are utilized for core stabilization and support. When your Parkinson’s client has a more difficult time directing a deep breath, singing can improve breathing capacity. I will often use the “e” sound with a single tone found in vocal warm-ups to give my client a focus. If the “e” sound gets repetitive, mix it up and use another vowel sound or combination thereof. You can also do scales using the same vowel sound. You will need a watch or clock with a second hand. First have your client sing “e” in a comfortable tone and see how many seconds the note is held. Inform your client how long the note was held and set a goal for the next breath. Keep going until the client improves and reaches full capacity. Be sure to let your client take a “catch up breath” when needed between singing breaths to avoid getting light-headed. Ten seconds is a good final target for holding the note, but make an individual goal since ten seconds might be too challenging for some people when breathing is difficult. If the client is able to multi-task, I match the singing warm-up with movement. Sitting or standing exercises are better for this since it is easier to take a deep breath—for example, Standing Chest Expansion with light springs off the end of the Cadillac. Have your client sing the “e” sound in a comfortable tone for the target amount of seconds while pulling the springs, and focus on a deep inhalation through the nose during the return phase of the spring recoil. I also use well-known songs that the client can sing when performing the exercise, which help with the breath and regulate timing. Most people know “row, row, row your boat” so I often pick that one, but let your client suggest songs too. For example, with parallel heel pushes sitting on the Wunda Chair, I would have my client sing “row, row, row your boat” and indicate that the bar should go fully up and down 3 times (or whatever timing you have in mind) before the phrase finishes. The coordination training we received as children through the developmental stage of crawling set the foundation for right and left brain hemisphere communication. Since the right hemisphere of the brain controls the muscles on the left side of the body and visa versa, the oppositional nature of arm and leg coordination during crawling activates the nerves across the corpus callosum connecting the two brain hemispheres. As adults, the continued integration of the two sides can result in better coordination, balance and efficient movement. The nerve networks can be stimulated and developed through cross-crawling exercises that utilize oppositional movement patterns. Although you could crawl on the floor, the “crawling” in cross-crawling does not mean you have to replicate the movement of babies. The main intention of every exercise is to use the opposing arm and leg. The exercises can be performed in supine, quadruped, sitting, or standing positions. It is also beneficial to try variations that move the limbs in the sagittal, coronal or transverse planes for better spatial awareness. The following are some samples, but certainly not all the possible options. Be creative and come up with your own choreography that serves the needs of your clients. Do a few repetitions of each action focusing on the ones that are most difficult for your client to achieve. A more challenging combination is to string several different variations in a row requiring quicker changes, rather than repeating one exercise several times. Even harder is to do a combination of several different variations and then decrease the time it takes to complete the entire set. If your client has difficulty performing cross-crawl exercises, that is an indication that coordination skills are lacking and the exercises should be added to your client’s daily practice. The senior population is one that can especially benefit by preventing falls (and possible breaks) though improved balance and coordination. In addition, clients with a homolateral gait (monkey walk) where the same arm and leg swing together can also benefit. I started doing these exercises with one of my clients who has Parkinson’s and he found them to be very useful in improving his gait and spatial awareness. 1) Lie of the floor with knees bent and feet flat of the floor. Cross the right elbow to touch the left knee. Return to the starting position. Repeat on the opposite side touching the left elbow to the right knee. 2) Lie flat on the floor with straight legs together and straight arms by your sides. Slide open the right arm along the floor and left leg away from the midline along the floor at the same time and return them back to the center starting position (similar to the action of making a snow angel). Repeat on the other side sliding the left arm and right leg away and back. 1) Start on all fours with hands below the shoulders and your face looking toward the floor. Simultaneously reach the left arm parallel to the floor by your ear and right leg off the floor in the opposite direction behind you parallel to the floor. Return them at the same time and repeat the opposite side using the right arm and left leg. 2) Try the above exercise with variations. Reach the left arm to the side (rather than overhead) parallel to the floor and take the right leg either back or sideways off the floor to the opposite side like airplane wings (leg side off the floor is more challenging to core strength). Repeat the opposite side using the right arm and left leg. 1) Sit in a chair with feet flat on the floor and arms down by your sides. Step the left foot forward on the floor and reach the right arm out in front of you parallel to the floor. Return to the starting position and then reach the right foot and left arm. This exercise could also be performed with the left foot stepping to the side and the right arm reaching laterally to the opposite side or the left arm reaching back while tucking the right leg under the chair (reaching behind would not be recommended for someone with shoulder issues). 2) Sit in a chair with feet flat on the floor and arms down by your side. Simultaneously step the left foot over the right foot onto the floor, take the right hand and place it on the left hip, and touch the left index finger to the nose. Return to the starting neutral position. Repeat to the other side moving the right foot across the left foot, left hand to right hip and right index finger on your nose. 1) Stand with legs hip distance apart and arms by your sides. Raise the right arm reaching toward the ceiling while simultaneously bending the left knee and raising the knee off the floor in a marching position. Return to the starting position. Do the opposite side raising the left arm and right knee. 2) Stand with legs hip distance apart and arms by your sides. Touch the right elbow to the left knee while simultaneously touching the back of your head with the palm of your left hand. Return to the starting position. Do the opposite side touching the left elbow to the right knee while simultaneously touching the back of your head with the palm of your right hand. Balance can be improved in the senior population not only with cross-crawling exercises, but also exercises that cross the midline to transfer weight from one leg to another. One of my clients was going to quit her line dancing class because she was frustrated with her poor balance negatively affecting the quick transitions required by the choreography. After about a month and a half of practicing her exercises daily at home, the transition was remarkable! She no longer had problems with her balance and was able to perform more complicated steps. She would have missed out on something fun that provided exercise and social contact had she not made a commitment to practicing. The “jazz square” is useful for practicing weight transfer from one leg to the other crossing the midline. Some people teach the jazz square starting with a forward step, but crossing the midline first may be more useful to practice weight transference. Start standing with legs together. Cross the right leg over the left and transfer the weight to the right foot. Pick up the left back leg and step backward. Shift your weight right to step sideways onto the right leg. Step the left leg forward. The weight will be on the left leg (instead of on two feet as in the beginning) and the step begins again with the right leg crossing over the left to transfer the weight to the right foot. Repeat to the same side several times. Try it on the other side starting with the left crossing over the right, step back with the right, shift side with the left foot and step forward with the right foot. Switching sides can add a level of challenge. When changing sides the last move in the step is dropped. There are a total of four moves in the step (cross, back, side, front). Perform the jazz square three times with the right foot crossing first over the left foot first. On the fourth set only do the first three moves (cross, back, side). This will put the weight on the right foot. Start the jazz square using the left foot crossing over the right for three sets. On the fourth set only do the first three moves (cross, back, side). This will put the weight on the left foot and the pattern can begin again. Coordination and balance are learned skills that begin in our earliest developmental stages. These abilities are perfected through movement challenges and practice. The body in its effort to be efficient will provide less wiring for these activities if they are no longer being used. As we age our activities must reflect a movement vocabulary commensurate with the quality of life we wish to maintain. Cross-crawling exercises that integrate brain function can improve coordination and balance making us more alert and aware. Once again the old adage of “use if or lose it” rings true. Some clients with Parkinson’s disease (PD) may experience difficulty moving from one piece of Pilates equipment to another after completing an exercise. This inability to propel the feet is a symptom of PD and is commonly referred to as “frozen gait.” With most clients, their unconscious mind gives them the commands necessary for their body to move and perform the next action. With PD, this automatic feature can sometimes be interrupted. Fortunately, we often can help our client “reboot” the system with a conscious command originating from another part of the brain. Once the body makes the first move, another part of the brain takes over for locomotion—like the jumpstart of a car battery getting the engine going again. Swing one leg forward. Think about swinging the leg rather than walking. Start with a long leg swing that will place that leg far in front of you (but not so far that you fall). Try goose-stepping. This was the marching gait of German soldiers. They would stiffly lock their knees and march by taking long stiff steps. Envision what they looked like and keep this thought as you take your first step. Think about a drum major’s marching step, raising one leg straight up off the ground before placing it forward. Envision that same movement when you get stuck. Think about a drill sergeant’s marching cadence: “one-two, one-two, one-two…” You might even count out loud. This might get you started and help you mentally envision a marching step. Thinking of a certain musical tune may be helpful. For example, a gliding first step may come more easily if you hum “Blue Danube” in your mind and imagine a ballroom dancer gliding in that same way. A boogie or rock and roll tune that brings a dance step to mind may also work. Find a target on the floor and step on it. Sometimes people imagine they are stepping on a fly in front of them. Look for an imaginary fly on the ground and try to crush it; this may get your gait started. A variation on this involves using a laser pointer to create a target to step on. If you point the laser light 1-2 feet in front of you and then think about stepping on that tiny lighted spot that may get you going. Laser pointers are used by professors and lecturers and may be purchased at bookstores. Consult with your client to see what tool works best. After your client begins moving, it is also common for a PD client to have difficulty maintaining the tempo, or to freeze again upon slowing down or stopping. One of my clients will put his hand on his wife’s shoulder when they are walking together to maintain a sense of rhythm in his gait, which he at times loses on his own. Impressively, he still skis and will count the ski lift towers and sing a song to himself like “one, two, three…and” to get ready to initiate push off from the ski lift and transfer his weight over his legs. This counting also becomes useful in Pilates exercises, such as with leg circles in the straps on the Reformer, to maintain fluid movement. If you think that your client is experiencing inconsistent or stilted movement, try leading with your voice “circle down 1,2,3,4, circle up 1,2,3,4” to maintain the rhythmic feel. Despite all your clever tricks, sometimes nothing works. When this happens, it is often a medication issue. Your client generally knows from taking medication when “on” and “off” efficacy times occur relative to the dosage and the time the medication was taken. Schedule your appointments based on medication peak performance to get the most out of a session. Brent Anderson PhD, PT, OCS of Polestar Pilates has a great recommendation for working with PD clients. He suggests that you provide a, “successful movement experience that exceeds their expectation.” PD clients may not always have the perfect Pilates form, but acknowledging and praising what they can do will empower them to recognize their own accomplishments and strive for success in the future. A working relationship with a PD client can be challenging for a Pilates instructor, but it is extremely rewarding when your client experiences improved function. Understanding the common symptoms, such as freezing gait, can help you know what to expect and to work with greater patience.